Opening Day For The Annual Wagner Festival : Deceptive Cadence The notoriously tough-to-get-into festival of Wagner's opera begins today in Bayreuth, Germany. Watch satirist Anna Russell's take on the composer's Ring cycle. For Wagner fanatics this is no ordinary Monday. 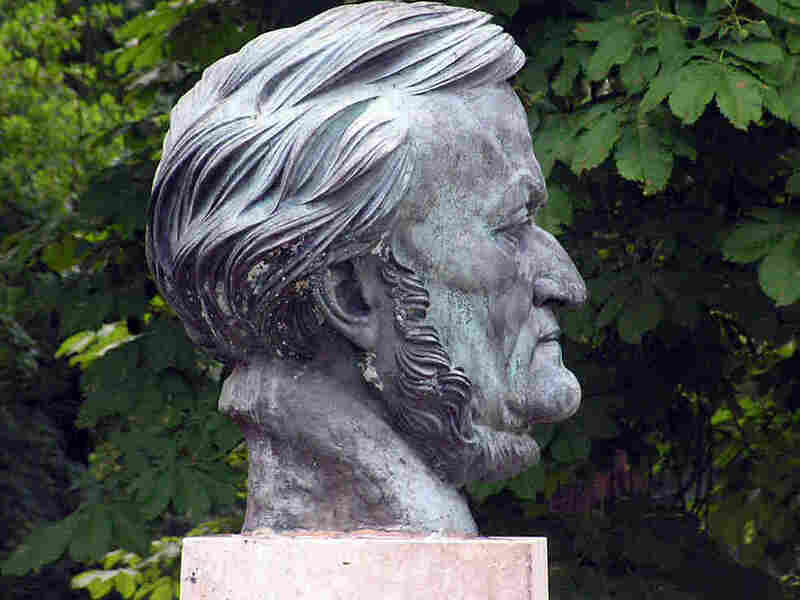 It's opening day of the Bayreuth Festival, the annual month-long series of Wagner operas staged at the theater he helped design and build in southern Germany specifically to mount his massive music dramas. So, no better time than now to revisit satirist Anna Russell and her irreverent take on Wagner's 15-hour tetralogy Der Ring des Nibelungen. After 135 years, the festival, which debuted Aug. 13, 1876, is still a pretty big deal in the opera world, even after all the distasteful Nazi affiliations and ugly intra-family squabbling for control (click here to see a family tree). Although Wagner is performed nearly everywhere, Bayreuth's prestige and its reputation for cutting-edge productions (many of which get roundly criticized) still make it the mecca for Wagner fanatics. Especially the "Ringheads," who travel almost anywhere to see productions of the Ring cycle. Back in 1876, the very first Bayreuth Festival was a pretty big deal too. Big enough to attract Tchaikovsky, Bruckner, Grieg and Liszt on opening night. I must confess, I've never made the pilgrimage myself, but like any other self-respecting Wagnerite, it's on my list of things to do before I die. And, I suppose, if I put my name in now I may just get tickets in time. It can take as long as 10 years to shift your way to the top of the ticket queue. No Bayreuth ticket this season? No problem, at least if you want to see the festival's production of Lohengrin. This year, for 15 euros, you can watch Andris Nelsons conduct the August 14th performance live online. By the way, Ring cycles aren't produced each year at Bayreuth.The next big one falls in 2013, the 200th anniversary of Wagner's birth. Film director Wim Wenders had been an inspired choice to guide that production, but contract talks broke down, partially over Wenders' desire to produce a 3-D movie of the operas at the same time. Wagner's great-granddaughters, who now run the festival, apparently couldn't come up with the money, and did not want their sacred theater turned into something as mundane as a film studio. Just today, Katharina Wagner announced Wenders' replacement. It's Frank Castorf, 20-year veteran of the Volksbüne theater in Berlin, who reportedly is known for his provocative productions. He'd better get a move on. Production designs are due this fall. In the meantime, there's always Anna Russell.